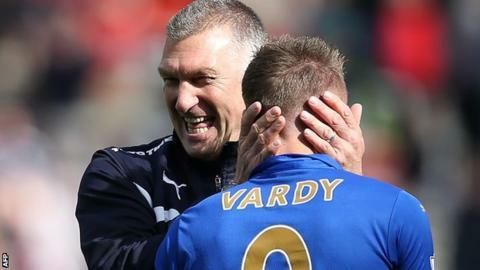 Nigel Pearson says critics can "like me or lump me" after he guided Leicester City to Premier League safety. Pearson's side, seven points from safety on 3 April, secured their top-flight status with a game to spare by drawing 0-0 at Sunderland on Saturday. "There will always be doubts about managers," said Pearson, reportedly close to losing his job in February. "I may have intensified one or two storms, but I work the way I work, and you can either like me or lump me." Leicester's last eight matches have brought them 19 points, as many as they gained during their previous 29 Premier League games this season. Survival has come at the end of a turbulent season for Pearson, who was fined and given a touchline ban for verbally abusing a Leicester fan during a 3-1 home defeat against Liverpool on 2 December. Widespread reports on 9 February suggested that the manager had been sacked, a day after a 1-0 defeat at home to Crystal Palace - though a subsequent club statement said those rumours were "inaccurate and without foundation". Pearson then called a journalist an "ostrich" - as well as "stupid" and "daft" - during a bizarre post-match news conference on 29 April, although he apologised the following day. Following Leicester's run to safety, the manager credited his squad for showing integrity in the face of perceived criticism this season. He said: "I think the key thing for us is that even in our darkest moments, and there have been a few, the players have continued to support each other and believe in their own ability. "That's difficult when people are questioning your integrity."